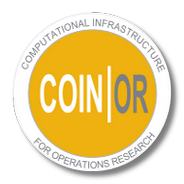 The continued existence and support of COIN-OR software depends on the generous monetary contributions of our supporters. Your tax-deductible contributions to the COIN-OR Foundation, a 503(c) non-profit, help support the COIN-OR infrastructure and supporting activities. Our download page describes how to download COIN-OR projects. If you have any trouble, send us feedback! Whether you’re having a little trouble getting a component to work, you’ve found a bug, you have a suggestion, or you just want to let us know about your experience using COIN-OR software, we’d like to hear about it. Send an email to the appropriate mailing list. We’ll try to answer any questions promptly, and all kinds of input will help us improve COIN-OR. If you’d like to keep up with COIN-OR developments or take part in discussions about COIN-OR, consider subscribing to one or more of the lists. Running the COIN-OR Foundation is a lot of work and we need your help! If you would like to donate your time, we need help with many different tasks, including Web development, coding, and general administration. Please check the Help Wanted wiki page or e-mail “tlc-chair” at this Web site’s domain name. If you would like to contribute to COIN-OR, we’d love to have your help. For bug reports, just send an email with your contribution to the appropriate mailing list. Minor changes are generally made fairly quickly. For contributions to existing projects or submission of new projects, see our Contributions page, which has details about the procedures we use. If you’d like to help but don’t have a particular task in mind, we can probably help you find one. First, however, you should get familiar with COIN-OR. Download and try out any of the projects you’re interested in and subscribe to the coin-discuss mailing list to get a sense of what’s going on. When you know what basic area(s) you’d like to help with, send an email to coin-discuss indicating what parts of COIN-OR you’re most interested in. We should be able to suggest something at that point.